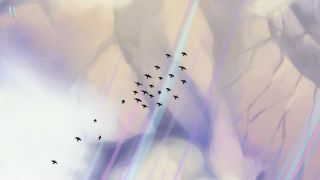 Here's something a little bit different to guide us into the weekend: Gathering Sky, a "meditative, experimental adventure about guiding a flock of birds across the sky." Gathering Sky begins with a single bird, who will eventually become part of a larger flock. The flock can be guided across the hand-painted sky, or it can be left to its own devices. And that's really it: It's a short, non-competitive adventure, playable by anyone, with a lovely art style and original score composed by Dren McDonald and performed by the San Francisco Conservatory of Music. A sample can be heard below. "Gathering Sky is a bit of a love letter to the games we'd like to see made: games that aren't about winning, scoring or conquering," developer A Stranger Gravity said in the release announcement. "We want you to sit down to wrap yourself in a short journey and return to your life feeling just a bit better." The critical response seems positive, and the Steam reviews, while relatively few in number, are quite upbeat as well. Interested? Find out more at gathering-sky.com.